Blue Door Artist Center and the Downtown/Waterfront BID are co-sponsoring the second round of a public art project for local artists – Yonkers Art Banners. These banners will draw attention to Yonkers, to its small businesses and its growing art community. 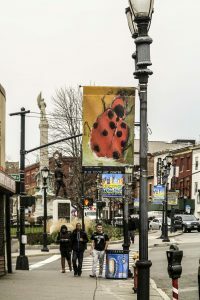 Artists are invited to submit designs for 30”x50” vertical banners that will be installed on light poles in Downtown Yonkers. The banners will be professionally fabricated on durable materials and will be on display for at least three years. We plan to install up to 20 new banners. Images will be selected by a panel of artists from the Blue Door Art Center in cooperation with the Downtown/Waterfront BID. Email attachments of up to six images. Files must be labeled with last name, first initial and title. Emails should be sent to [email protected] CD submissions are also accepted and may be sent to Blue Door Gallery, 5 Hudson Street, Yonkers, NY 10701. This entry was posted in Exhibition and tagged public art, Yonkers. Bookmark the permalink.